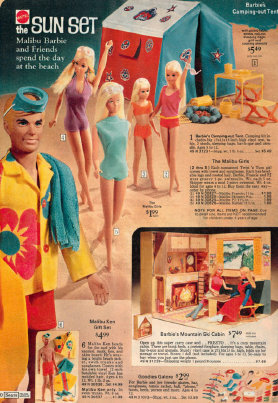 Ken only had three gift sets that were exclusive to him from 1961 until 1972. There were six sets he shared with Barbie in the 1960's. Those can be viewed by clicking More Gifts Sets. Click the item number by the picture to see what's available for purchase! The Sears Exclusive Casual All Stars gift set for Ken or Brad included two pairs of trousers, two shirts, a jacket, shorts, shoes, socks, and two ties. It retailed in the 1970 Sears Catalog for $3.97. In 1971 the price was changed to 3.99, and in 1972 reduced to $2.99. The colors and fabrics in this set may vary. This fun grouping included Malibu Ken doll who wore orange swim trunks. Also in the box were a floral shirt, yellow sandals, blue sun glasses, diving mask, snorkel, fins, beach towel, and skim board. This set originally sold for only $5.99 as listed in the Sears catalog in 1971. In 1972 it was reduced to 4.99. 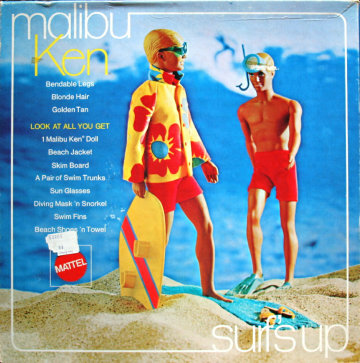 Both years Sears called it the "Malibu Ken Gift Set"
This very hard to find set included Good-Lookin' (bendable) Ken, as well as a striped blazer, navy shirt, red slacks, and tie. He was dressed in his swimming trunks and sports shirt. It retailed for $6.99 in the Sears Catalog. The catalog titles this set "Bendable Ken with Gift Set"